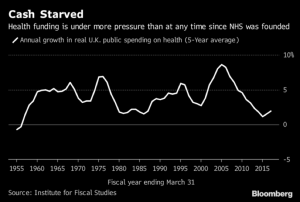 The financial crisis that has been raging through the NHS for some years is now impossible to hide and so it is now being publicly recognised even by the Conservative government, thanks to public pressure and sentiment, that the NHS is starved of resources. A head of steam seems to be building up under the idea that it will take a lot more money and that the government should stump up extra cash to prevent the NHS from going under. The argument put forward by a small minority within the Establishment that privatisation alone is the saviour of Britain’s health services strikes no chord at all with the majority of the public. 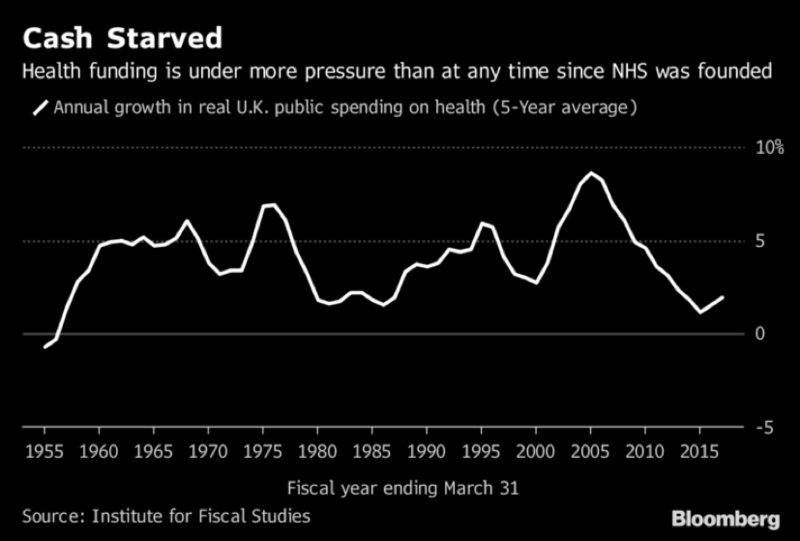 The Lib-Dems have long pushed for tax increases to better fund the NHS and this line, or something like it, is now being taken up by others across the full spectrum of bourgeois political parties. A new report; – Securing the future: funding health and social care to the 2030s, has been released by the Institute for Fiscal Studies and The Health Foundation. This report claims that “since 2010 measured productivity in the health service has been growing faster than productivity across the economy as a whole” to emphasise that no more ‘savings’ can be made from screwing the staff and points out in conclusion that UK spending on healthcare will have to rise by an average of 3.3 per cent a year over the next 15 years just to maintain NHS provision at current levels, and by at least 4 per cent a year if services are to be improved. Social care funding will need to increase by 3.9 per cent a year. It is thus being mooted that increased income tax is now the only way to find the extra cash. Considering that the founding point of the NHS was that it should be free at the point of use and paid for collectively through taxation, the idea of big tax increases to ‘save’ our NHS is only common sense . What the public must insist on is, first, that the money must come from those who can most afford it, and, secondly, that the direction in which the money must travel should be entirely towards patient care. Considering how much of the entity we call the NHS is already privatised and how much those privatised sections hiding within the body of the NHS are gulping down huge chunks of that money to deliver services within it that could be organised and done much more efficiently in both financial and patient-friendly terms, it begs the question: – where will any extra money go? Add to that the vast amount of money sucked out of the NHS budget by the hundreds of PFI daylight robbery schemes, the top heavy hospital and regional health service management structures that penny-pinch on services, staff, and patient safety while awarding themselves massive bonuses, and whose members take redundancies to claim huge golden handshakes only to take on the same job at the same bloated rate of pay after a month or so of holiday, then the crème de la crème of cash sucking leeches greedily gobbling up the NHS finances, the gigantic drugs companies who to such a large extent dictate what drugs the NHS will purchase and the bloated price that will be paid, just where do we really think that extra cash ‘for the NHS’ will really go? He is right, but for our part we would ask Mr Wolf to go further: If he wishes to be considered politically brave he may wish to fight for, along with tax increases which should be guaranteed to go only to the NHS, the complete re-nationalisation of every part of our health service, the taking of every hospital back into public ownership with no compensation to the thieves who have already made more than enough from the PFI schemes, the dismantling of the management structures to the minimum required and the reinstatement of national pay bargaining and awards for all the staff. Making sure that all wards and departments are adequately staffed to do the job required and cover illness and holidays without recourse to private companies, employing doctors and nurses as bank staff; and lastly, let Mr Wolf throw his weight behind the complete nationalisation of all drugs manufacturing in this country, a move that could not only mean vastly lower payments for the drugs that the NHS needs but also a move that could restart the quest for finding cures for diseases, a quest that was quietly shelved many years ago as cures do not bring the same profits as lifelong treatments with various new drugs and the constant hope of a better life by the sufferers. I have now spent a couple of weeks in this PFI hospital due to bowel cancer which they have been unable to remove fully and which there doesn’t appear to be any further treatment for. I must say that every staff member I have met has been dedicated to their work and wonderful, warm human beings whether they have been doctors, nurses, cleaners, the people who bring food to the wards, porters and electricians. I have engaged them all in conversation regarding the hospital, the service given and the treatment of staff. The work they carry out under extreme pressure is exacting and they are painfully aware that they cannot see to everyone as well as they would wish their own relatives to be seen to but occasionally their number is made up by bank staff, usually nurses, who have lost jobs in the hospital in the past but who now work for agencies in the same hospital covering staff shortages. The agencies charge highly for these nurses’ labour power, but these workers don’t see anything beyond an hourly rate not much more than the staff employed in the hospital but with even less guarantees of work than their fellow workers. I have spoken to cleaners and the deliverers of food who, in many cases, need to have second jobs to survive. These people work solely for the owners of the PFI hospital and they have told me of the cleaning of the bed-surrounding curtains, all of which have to be regularly cleaned at £370 per curtain. Of charges for all staff of £20.00 per month for parking in the hospital whether they are working or on sick leave or holidays. If there is no parking space in the designated staff car park they have to park in the visitor’s car park and pay the going rate for the day in spite of already paying the £20.00 monthly rate. Any attempt to squeeze into a gap at the side of a parking space in the staff area will now be met by daily fines of £30.00 plus the visitor’s rate taken from their pay. I didn’t write my illness at the start of this letter for sympathy, I do not require it, I wrote it to point out that at 80 years of age, I was probably lucky to receive one operation to try to remove the cancer, it seems that my age will prohibit me getting any further treatment because that is not cost effective. Only in a future socialist society will we get the health service that both we and the hospital staff deserve so if your concern is the NHS you really have no choice, fight to change the society you live in! Since this letter was written we have heard news that the PFI Pinderfields hospital is to be handed to a new, non NHS management and a strike ballot of staff was revealed today to be over 97% in favour of strike action. The ballot, of course, was only of those members of staff who remain employed by the NHS and not those employed directly by the PFI owners of the hospital. It seems that when/if the new management team take over, all the staff now employed by the NHS will be employed by the new group. The privatisation no longer seems to be using stealth. Three CPGB-ML members, including cde Coates, went immediately to the union office to offer help with picketing when the time comes and getting the message out beforehand.